This handy book by Dr. Hartog was just printed, though it is an updated third edition. 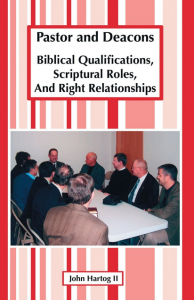 The sub-title is “Biblical qualifications, Scriptural roles, and right relationships.” Most of the book is given to a verse by verse study of the qualifications for both Biblical offices. The emphasis is on the pastor as shepherd, taking oversight of the congregation without becoming a dictator or overly timid. Hartog believes that a pastor should never have been divorced, should totally abstain from alcohol, and have his children which are at home under control. An added benefit of the book is Mrs. Hartog’s appendices to pastor’s wives on having helping ministries for women in the church.